International Communist Current | Workers of the world, unite! 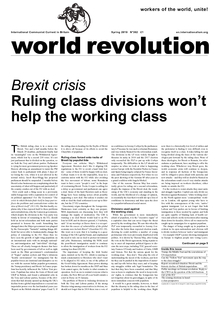 It would be a great mistake to think that the disarray in the ruling class in the face of populism is helpful to the working class. Right now there is a historically low level of strikes and the proletariat is finding it very difficult even to recognise itself as a class. It risks falling for and being divided along the lines of the various ideologies put forward by the ruling class. None of these ideologies, for Brexit or Remain, for referendums or parliament, have anything to offer the working class. Correspondence: can the “Yellow Vest” movement open the way to the class struggle? We are publishing here large extracts from a reader who, while welcoming the overall approach of the leaflet on the Yellow Vest movement distributed by our section in France also criticises certain of our positions, in particular the idea that nothing good for the proletariat can come out of this inter-classist movement. These questions touch on extremely important aspects of the proletarian struggle: what is the working class, its struggle, its perspective. Rosa Luxemburg belongs to the proletarian revolution, not to the social democrats! Today on blogs and forums, in bookshops and kiosks, throughout Europe and in the world, a new nauseous campaign has resurfaced in order to again distort the image of the militant Rosa Luxemburg. Thus, from television programmes, Rosa Luxemburg again appears under the sole traits of a “woman” and a “pacifist”. The very-well known and acclaimed paper, Le Monde, published an article in September 2013, written by a certain Jean-Marc Daniel, a professor of ESCP Europe, with the very evocative title: “Rosa Luxemburg, marxist-pacifist”. This association of the words “marxist” and “pacifist” is gob-smacking: for the ruling class the “real marxist” is one who abdicates from the class war, renounces the insurrection and the overthrow of capitalism. In 2008, the financial crisis which hit the United States hard, with several banks failing one after the other, suddenly plunged millions of proletarians into misery. Among the main symbolic characters of the banking sector, Lehman Brothers, one of the great pillars of the American economic system, quickly fell into bankruptcy, provoking panic throughout the entire international banking system of which it was one of the star players. Today, when the threat of new financial storm appears again on the horizon, the media have a launched a devious propaganda around the ten-year anniversary of the collapse of Lehman Brothers. Our comrade Elisabeth has left us at the age of 77. She died from breathing difficulties which provoked a cardiac arrest, on the night of Saturday/Sunday 18 November. Did May 68 really mark the end of almost 50 years of counter-revolution? In this article, we aim to show how the ANC’s project of rescuing and defending capitalist social relations in South Africa was implemented methodically by its successive leaders, in the first place by Nelson Mandela. In the previous part of this series, we re-published the article ‘Welcome to Socialisme ou Barbarie’ written by the Gauche Communiste de France in 1948. 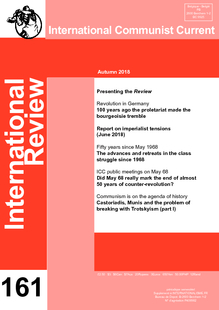 The article took up a clear position on the nature of the Trotskyist movement, which had abandoned its proletarian credentials by participating in the second imperialist world war. In this new article, we will seek to show how right the GCF were to be cautious in their welcome to SouB, and how difficult it is for those who have grown up in the corrupt milieu of Trotskyism to make a really profound break with its fundamental ideas and attitudes. In the increasingly poisonous atmosphere of conflict and crisis in the Middle East, the ICC welcomes the appearance of the following article which is one of the rare expressions of a genuinely internationalist standpoint emanating from inside Israel. 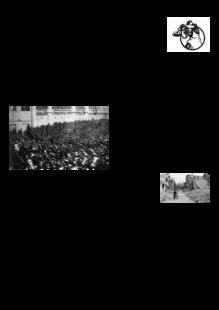 The author takes up the marxist position that all national struggles and slogans in the epoch of capitalist decline have become reactionary, and does not hesitate to argue that the only way out of the trap created by imperialism in Israel-Palestine is the unification of Israeli and Palestinian workers on a class basis, leading towards a proletarian revolution against all bourgeois states. Recent expressions of US foreign policy, particularly but not only in the Middle East, show the impact of populism, exemplified in the Trump presidency, and the consequent strengthening global tendencies of every man for himself, unpredictability, chaos and open divisions within the ruling class. The following article is one of several through which we plan to deal with the rise of China and its consequences for imperialist relations worldwide. For reasons of space we will focus in this article on the New Silk Road. In future we look in more detail at Chinese ambitions in Africa and Latin America and examine its overall rivalry with the US. March 2019 marks the centenary of the foundation of the Third, Communist International, one of the high points of the international revolutionary wave which swept the globe at the end of the First World War. We will be producing a new article to celebrate and analyse this historic event, but in the meantime we are drawing readers' attention to what we wrote in 1989, 70 years after the formation of the CI; this is an article which retains its relevance today. In November 2018 the two main groups of the communist left in Britain, the ICC and the Communist Workers Organisation, held meetings in London on the centenary of the German revolution. From both meetings it was evident that there is fundamental agreement on a number of key points arising from this experience. And yet there were also definite disagreements between our two organisations, which emerged at the CWO meeting and were further debated at the ICC meeting the following week, which was attended by a member of the CWO. This article looks at the principal differences that emerged. Police violence, riots, urban guerrillas, looting... The real cause of chaos and violence is capitalism! The real, organised, systematic violence on the streets of France in recent weeks was that unleashed by the state which had encountered the anger of "the people" folowing years of austerity. But this "popular revolt" of all the "poor" of "working France" who can't "make ends meet" is not as such a proletarian movement, despite its sociological composition, as the following article explains. A hundred years ago we were at height of the world revolutionary wave – more precisely, the outbreak of the revolution in Germany, a year after the proletariat took power in Russia, in October 1917. “100 Years ago, the proletariat made the ruling class tremble”. This title may sound odd today because this immense historical event has more or less been consigned to oblivion. The bourgeoisie has succeeded in erasing it from the memory of the working class. And yet in 1918, all eyes were on Germany – a source of hope for the proletariat, and of fear for the bourgeoisie. An article from a close sympathiser showing that despite and even because of the omnipresence of war in the Middle East, the class struggle can still raise its head. In August Internationalist Voice posted a position on the ICC's web forum on the wave of protests in the Middle East affecting the countries of Jordan, Iran and Iraq. Here is a response from a close sympathiser of the ICC. In a region scarred by imperialist war and sectarian divisions, the recent social protests in Iran, Jordan and Iraq offer hope that there is another possibility: the united struggle of the exploited against capital and its brutal violence. This article, written by a close sympathiser, looks at the massive demonstrations that have swept through central and southern Iraq. Starting on July 8, 2018, a number of spontaneous protests broke out in central and southern Iraq involving thousands of demonstrators. It spread through eight southern provinces very quickly and, about a fortnight later, onto the streets of Baghdad. These followed significant protests in Jordan and Iran on exactly the same issues. The movement in Iraq would have been aware of these protests and inspired by them given the basic similarities. Should communist resources be managed centrally? Margarete von Trotta's "Rosa Luxemburg"